Dress up, protect, and refresh your old dining room chairs with these beautiful Deconovo Dining Room Chair Cover. 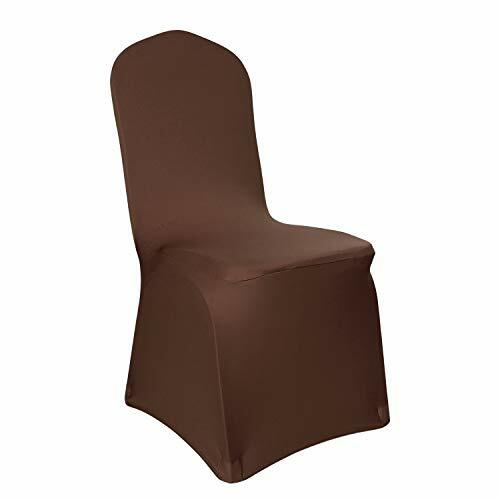 Each of these stretch chair covers are crafted from a machine-washable polyester and spandex blend, making them easy to care for.Deconovo Wedding Stretch Chair Covers perfect for banquet chairs, dining room, party, wedding chairs. This high quality stretchable fabric fits a variety of chairs, and you can put it on chair easily. >Crafted with high quality 3% spandex and 97% polyester, flexible enough. So the process of stretching over the chair won't take too much time. Protect your chairs from pet damages and time fading. Size: 17.7 x 17.7 x 38.6 Inch / 45 x 45 x 98 cm. Package: 4pcs, 6pcs, 12pcs, 20pcs. Perfect for special occasions (Christmas, Kinds of Parties , Mother's Day , Happy Birthday, Wedding and so on) and daily use. Color: there are 12 colors for choosing. Blue, White, Red, Purple, Yellow, Fuchsia, Light Beige, Light Grey, Brown, Black, Navy Blue, Dark Grey. What's more, it's easy to clean without extra trouble. Your package will include 4 pieces of chair slipcovers. Do not hesitate to contact us if there's any issue with your order or product. The size of chair covers are 17.7L x 17.7W x 38.6H inch / 45 x 45 x 98 cm. .
Deconovo chair protector covers are perfect for home dining chairs and also be used in hotels, wedding celebrations, banquet, party decorations, offices, ceremony, and many more. Care Instructions: Machine Washable with cold water. Tumble Dry Low. Do Not Bleach Nor Ironing.